Unsettling, challenging, but ultimately rewarding, the musical output of Lars Stöwe under his Anstam identity is multi-layered and crackling with intensity. Arriving unannounced in 2007 with his Aeto 12”, he released two further platters in this concept trilogy on his own Anstam label before being championed by Modeselektor’s 50 Weapons imprint. Keeping his identity as much a secret as possible, the producer focused on the creation of crushing atmospheres, instilling patience in his fans with a slow trickle of releases. Dispel Dances, his first album, came at the end of last year and confirmed that the meagre offerings from the small handful of EP’s we’d received were just a hint of what was to come. In long form, Stöwe’s vision took flight, showing that there was much more up his sleeve than moody, industrial techno-laced, bass skirmishes. The recent Stones And Woods again confounded expectations, whilst keeping the brooding characteristics that have become an Anstam trademark. Little White Earbuds got in touch with Stöwe to find out more about his approach to production, the other mediums of art he promulgates, and the soft-synths he creates to make his tracks more challenging to produce. He also provided us with the ultimate in our regular series of podcasts for the year, our 147th exclusive and one that you won’t soon forget. Up until more recently there has been a slight air of mystery about Anstam, with people being a bit unsure as to whether you were a solo artist or more than one person. Did you intentionally cultivate this lack of exposure? Do you see the playing the press game as a necessary evil? Lars Stöwe: As a cocky artist I don’t have problems to talk about the work I do. So, if somebody take his or her time to think about some decent questions about Anstam, why should I not answer them? But I consider the promotion thing not really as my job. I make art and that is the thing I am good at. When Anstam was simply the idea to release 12″s with the Hard Wax, there was no Anstam promo department, that is why there was no information besides the music and nobody had a problem with that. But that was 2007. Now, at 50Weapons, there is such a promo department and that is how a decent label has to work nowadays in 2012 to get the music to the people. But I am still not a fan of the idea to foist people into Anstam. Do you feel the open nature of the Internet detracts from the ideals that electronic music was once this slightly mysterious scene where the producers could create a sort of illusory folklore about themselves? Yes, the crazy little thing called Internet. I guess it feels more and more irrelevant to me. If you read the first manifestos about radio or television in the early days, it is always about the chance for human mankind to make the world a little better in terms of social interaction, it is about sending and to be heard and about exploring. There was always a utopian vision about these inventions. Now, when you watch TV or listen to the radio you won’t find anything utopian about it. You won’t find anything at all. Internet is about to go down that road, too. It is a great and revolutionary tool like radio and TV, but the most people get the nature of these tools wrong. These tools are revolutionary in terms of transporting information and making information available, but they can not help you to generate information or help you to make your content more profound. If there are 100 more blogs or Internet sites that don’t mean you have 100 times more information or that the information gets 100 times more profound. It just means that there are 100 more people talking about the same things. Luckily I grew up in times where it was more important to work on your content in order to have a good and decent product rather than simply being good at social media stuff. If you have that content, Internet is wonderful and can do you many favours, but it is unfortunately very good at distracting you, too. I’ve made music for many years before the first release came out that got me reaction from the public. That means that I had enough time to think about what I like in music and why I like it. I had enough time to build my own kind of individual music taste. I think nowadays that is really difficult to do, because you don’t have to make any decisions and sacrifices any more. It is all there. You have access to all the music in the Internet and you don’t even have to pay for it any more. And like a kid that has a big room full of toys it will not spend much time with one of them. So, I guess that will lead to a generation that listens to all kinds of cool music but doesn’t know really why. In the days where electronic music was a mysterious scene, that only worked because people still searched for music. It was about music for those who know. It was a game that was satisfying for all sides. But in the end even that all was based on really outstanding forward music. You have said that you’re more into the composition behind a track rather than being seen as a producer per se. I’m interested to know then how you typically approach making a track. Would you say it’s more based around ideas rather than trying to make something for a dance floor? A while ago I read a review about Anstam that started with: the German techno producer Lars Stöwe… and then it talks about how the songs change very much and that the rhythm structures are very complex and hard to follow. And that is exactly the problem. 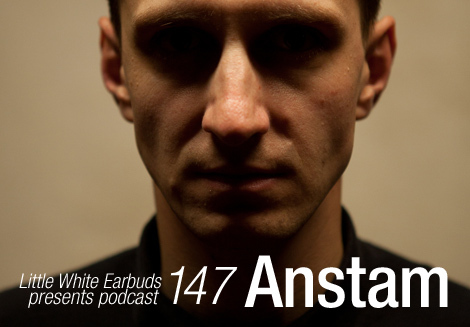 If I really were a techno producer then Anstam would be bad techno, because it does not follow the rules of techno. Techno is about the archaic ritual to dance together to a very minimal but strong rhythm that doesn’t change much over the time so you can dance yourself in some kind of trance. Anstam was never about that. Techno is based on the hardware it was made with. It was made with drum machines and sequencers. It was always pattern based, always about short loops which only got manipulated by turning some knobs or muting the bass drum or hi-hat track. Anstam never was about that. So you might think Anstam was never about the dance floor. But that is wrong, too. Making music for the clubs just means you make music for a big room full of upbeat people and a massive sound system. That doesn’t mean the only possibility to spent such an evening is to dance 8 hours on chemical drugs to the same bass drum beat. Anstam works well in the clubs. I know it might be challenging music but it is not that the people left the dance floor when I start to play my live sets. The rhythms are not too complex to dance to and that the songs change very much only means there it’s a hour of music that will not bore your head while you are dancing. I think there is nothing wrong about that. It is true that in the studio I want to compose, write songs rather than finding the perfect hook to dance to. But all the music that I wrote always had a strong groove and the drum was always the centre of the songs. That is way I never had the fear these songs might not work in a club or at the dance floor. How long was the Anstam sound in an incubation period before you first released? I don’t know really. I remember playing a live concert with my brother Jan and my friend Andreas Schulz as the Jaap Versainc Ensemble at a gallery in Leipzig in 2005 or 2006. That concert was more like Neue Musik with a little bit poly-rhythmic Steve Reich reminiscences packed in modern sound. I don’t know why we did it but we end that concert with a really bad and brutal sounding 140 bpm stomper which then turned slowly into the B-side of the first Anstam 12″. So, I guess there was a incubation period of one or two years. There’s an interesting interview with you in which you talk about creating your own synthesizers with Max MSP to operate in very particular ways. Do you find the process of music more challenging if you set yourself certain parameters to work within, or have you done this to open new possibilities? I think I am a pretty rational thinker. That is why I love algorithms. And in the late 90’s when the computers were getting better and better there was a time with Autechre and even Aphex Twin, when people started to ask themselves how much of these music was done by the computer. The idea to write software that will produce you a song just by pushing the “DO IT” button, which by the way is not so difficult as it may sounds. At that time I had a study course at my university about Pure Data, which is some kind of open source pendant to Max MSP. For me that was a lovely playground, because it basically was all about algorithms and I was fascinated by the idea of self-generating compositions. The idea that you don’t buy audio files but software that will play endless compositions based on parameters you as the composer had chosen. Nowadays you can buy that stuff as a iPhone app, but at that time it still was quite a revolutionary thought. I worked a lot with PD and Max MSP at that time and gave concerts based on MAX MSP patches were I had rhythm patterns that would transform randomly over a very long time based on poly-rhythmic algorithms. As I said before, I was a big Steve Reich Fan. You’ve now released two full length albums. Has there been a shift in the way you approach making music or perhaps other ideas that have informed these albums in different ways? The way I made Stones and Woods equates very much the way I worked before Anstam. I always produced in album format and I feel much more comfortable in doing that rather than doing 12″. Its a little like the difference of writing a novel and writing a short story. I really like to get lost in my work. I like to construct things and I like a little bit of insanity. 45 minutes is a good time to work all that out. But of course every Anstam album has different issues I am interested in. Dispel Dances is like a black monolith. It was my debut album as Anstam and I wanted it to be inviolable. It turns out to become very relentless as well, which was some kind of tolerated side-effect. But at that time I knew already what I wanted to do on the second album, Stones And Woods, and the last Dispel Dances song “Say My Name” was some kind of review to that. I wanted to stop all that genre discussion about Anstam, and wanted to make simply a beautiful album with all that beautiful stuff that beautiful albums have. Dance songs, ballades and a little bit of the typical Anstam idiosyncrasy. And instead of that stone cold darkness I gave more way to a profound melancholia. There are some obvious references in you tracks which you have talked about before, but are there less obvious musical influences that have also played a big part in the music you make? I was born 1979 in the DDR in East Berlin. So as a child I listened to a lot of DDR music which was a really good early music education because there were a lot of outstanding albums produced in the DDR. I’ve started to collect the original vinyls from that time just as some kind of childhood memories, and as I listened to them again I was shocked how extremely good these albums were. For example the first two albums from Manfred Krug and Günther Fischer, Das War Nur Ein Moment and Ein Hauch Von Frühling, Silly’s Bataillon D’Amour or the Stern Meissen Album from 1981, Reise zum Mittelpunkt des Menschen. Even Reinhard Lakomy, most famous for the child album Traumzauberbaum (if you have children you really love, then play them this album, even if it’s in German), did really cool electronic albums like Das Geheime Leben and Der Traum Von Asgard. There was a big electronic scene in the DDR and most of the the bands really liked to use synthesizers in a proper way. To make a long story short, in terms of music I could not have been born in a better place and I guess you can still hear these East German influences in my records. Your music seems to trade in the kind of sounds and arrangements that recall 20th century composers. Was that something you specifically wanted to evoke? Why did you choose an orchestral palette to create your more abstract, broken beat style? I never thought about it that way. But I think I have the same approach as a orchestra to use the whole frequency spectrum in order to make the sound as full as possible. And like classical music I always have the need to make it impressive in any way. There is a lyric from my all time favorite band, Ved Buens Ende, that goes: “singing songs that even brought the devil to his knees.” Blame it on my German genes, but I always wanted my music to have that majestic greatness and weight, too. Do you consider your Anstam project to have a finite shelf life and that you will perhaps work on a different musical project when you have done everything you can with it? That will definitely happen. I think Anstam is now at the last third of the second phase. There are still things to be done but I am starting to work more and more on other stuff, too. Right now I have the strong need to split Anstam into its two extremes. One studio project that is really song based with vocals and more physically played electronic instruments and the other one would be more like a hook based club project. We will see. What can you tell is about the mix you out together for us? When I play DJ sets I always have two big options. I can do it the pulsating bass drum way or I can do the breaks. This mix is a typical breaks mix, that I played at the Gretchen club in Berlin. It is a mixture of slow 90bpm techno and breakbeat stuff and 180bpm jungle (or whatever the kids call it nowadays). In the end, this mix shows my profound love for the drum. It is a digital made mix. No real vinyls were used. What can we expect from Anstam over the next year? Everything I have released under Anstam came in trilogies. So, it is most likely that there is one trilogy that will be finished in 2013, too. Beside that I will play very few but well selected Anstam live sets, mainly at festivals I think, and I will tour the clubs with sophisticated DJ sets. Then, as I said before, I work on a new project that maybe will release some 12″ on different labels in 2013, material that is more focused on the pulsating bass drum techno thing that never will come out of fashion. And I am a born and raised Berliner, so I am allowed to do techno whenever I want to. At least I hope that. Such a good mix. The Gangstarr x Rollercoaster – jeepers deepers! !